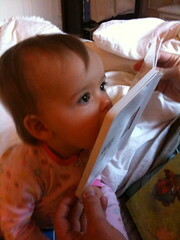 Cate had her 12-month checkup last week. This visit could not have been more different than our last doctor's appointment. Multiple people have recommended this particular office and with very good reason. Everyone was so kind and friendly. The doctor was so nice and spent AN HOUR with us. Cate loved her doctor and did all of her tricks – clapping, waving, and kissing. Yes, she kissed the doctor (open mouth, tongue slightly sticking out) on the check. And this was *after* her vaccinations. Think this kid is social? Cate is actually quite petite at a year although she has a belly to rival a sixty year-old beer-drinker. She is 29 inches long and under 19 pounds (only 10th percentile).